Camping at Mirror Lake State Park | Mirror Lake State Park Visitor's Guide - Baraboo Wisconsin. Cliffwood Campground – This campground is open from the beginning of May until the end of October with all sites reservable. The majority of the sites are electrical and wooded. A few of the sites are grassy with shade trees. Please look at the individual site descriptions for more information. Sites 106-121 and 126&127 are double sites. This simply means that the driveway entrance is shared and the individual sites are a little closer together. These sites are ideal for parties camping together but can be reserved by individuals. Toilet & Shower facilities are seasonal and weather dependant but Vault Toilets are available in the campground. Cabin in the Woods – This ADA accessible cabin is available from May 15 – October 15 for persons with disabilities. Click here for information and availability or contact the park directly. Dump/Sanitation Station – Our Dump Station is open from Mid-May until October. These facilities may be open during the day in the early spring and late fall depending on temperatures. 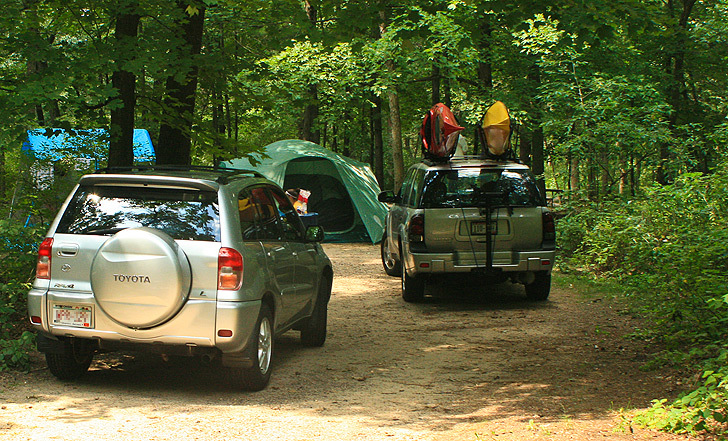 Water Availability – Water in the campgrounds and at the dump station is seasonal and weather dependent. Drinking water is available at the park office year-round from the spigot located next to the soda machines. Vehicle Admission Stickers – Vehicle admission stickers are required. Stickers may be purchased upon arrival or click here to purchase before you arrive. Tip – sites 66 through 83 (outside loop sites) are located very close to the Interstate. Some of these sites are in fact within eyeshot. So expect to hear and see traffic 24 hours a day at these sites. We recommend choosing a site on an inner loop if possible. You may call also for reservations at – 888-WI-PARKS (888-947-2757), the toll-free number for Wisconsin’s new one-stop campsite reservation call service. Mirror Lake & Rocky Arbor State Parks Full? Here are some direct reservation links for other regional state parks. Wildcat Mountain – Near Tomah, WI. Wyalusing State Park – 2.5 hours west on the Mississippi River.